Posted May 22, 2017, in News. 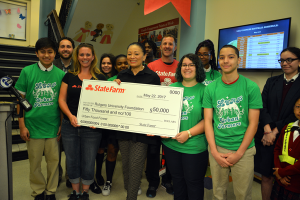 The State Farm Youth Advisory Board donated $50,000 to an agricultural program designed, in part, by students from the Leap Academy University Charter School in Camden. Page last updated by Community Leadership Center at 3:45 pm July 28, 2017 . This page was printed from http://clc.camden.rutgers.edu/2017/05/22/state-farm-youth-board-donates-50000-to-camden-leap-program/ at 2:38 AM Friday, April 26, 2019.